If you got one of those amazing new iMacs with the crazy 5K pixel resolution, you’d be crazy not to watch this stunning animation of the sun by YouTuber James Tyrwhitt-Drake. You can gaze at the star at the heart of our solar system for a full eight minutes, using YouTube’s new 4K resolution setting and that killer new Mac. This timelapse covers about 16 days of solar activity, focusing on the largest sunspot in the last 22 years (about two solar cycles), which is cleverly named AR 2192. Gorgeous, right? 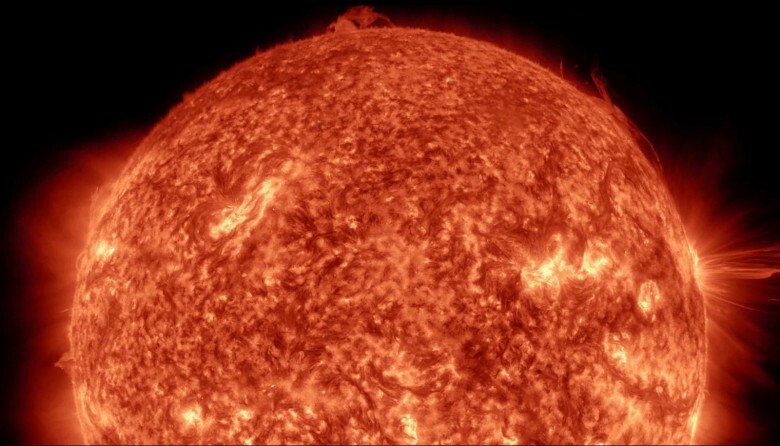 The animation is made up of over 17,000 individual images, which translates to about 72 GB of data gathered by NASA’s solar dynamics observatory in orbit around the Earth. The video below shows the sun in an ultraviolet wavelength (304 ångström) and covers about 53 minutes per second of film. You can grab images yourself at the Helioviewer website, but Tyrwhitt-Drake rendered all of his images into one crazy-high-rez video, which you can watch at insane 4K resolution, resized to YouTube’s 3840×2160 pixels. Wow. The sound you hear playing is the “heartbeat” of the sun, data processed from the Helioseismic and Magnetic Imager by Alexander G. Kosovichev. Seriously, if you want to lose yourself in the grandeur of our natural universe, this is a great place to start.